With each player trying to hit numbered pylons that pop onto the screen at random, player action is frantic: It's like gettting paid for fender-benders. Your customers get paid too, because Crash 'N' Score keeps players coming back for more, Compact physical size, exciting graphics (there are even colored overlays on the Crasn 'N' Score monitor) and rugged construction make Crash 'N' Score at home in more locations, makes you a profit winner. 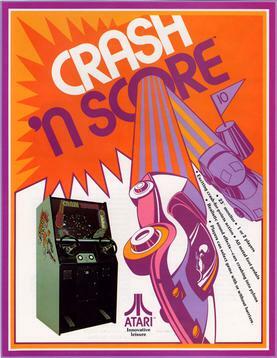 Unique player-selectable game choice capability – with or without barriers – means Crash 'N' Score will stay new, always a challenge.